The man in the back said everyone attack. My Halo Wars 2 demo started rather bleak: 343 Industries’s Dan Ayoub led off talking about the death of the real-time strategy genre. Gloomy or not, it’s a familiar theme at this point. While reports of the RTS dying might be exaggerated—Total War still sells well, Grey Goo made some waves, Homeworld: Deserts of Kharak had some high points—it’s still lean times for a genre that dominated the ‘90s and early 2000s. “Maybe they’re too complex!” “Maybe they’re too slow!” “Maybe MOBAs swallowed up all the RTS fans!” A quick Google search and you’ll find plenty of threads speculating on the reason. 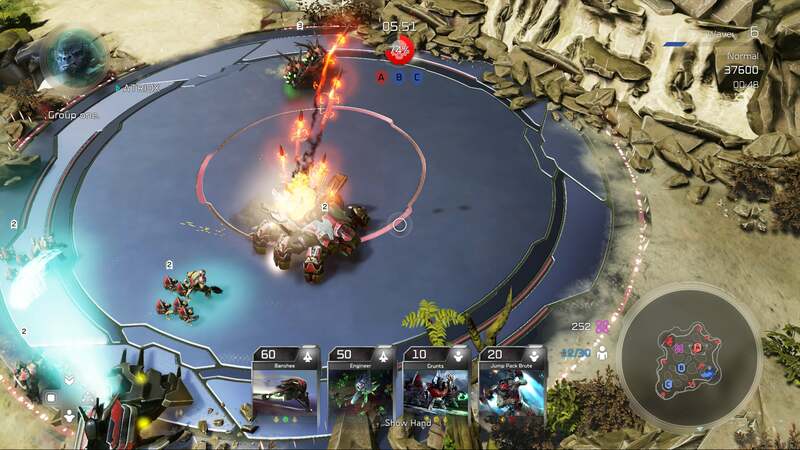 But Ayoub thinks Halo Wars 2 has a good shot of winning an audience—and after my hands-on demo this week, so do I. At least Halo Wars 2 is avoiding its predecessor’s sins and coming to PC day-and-date with the Xbox version, alongside a long-missing PC version of the original Halo Wars. 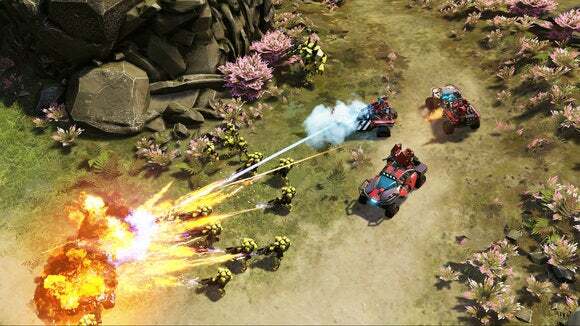 It functions like a PC-centric RTS (control groups, map-clicking, et cetera) and there’s a full cinematic-ridden campaign, plus the usual RTS multiplayer. I don’t know if those modes are good. I watched two very pretty cinematics for a taste of the campaign, but didn’t get around to trying it hands-on. 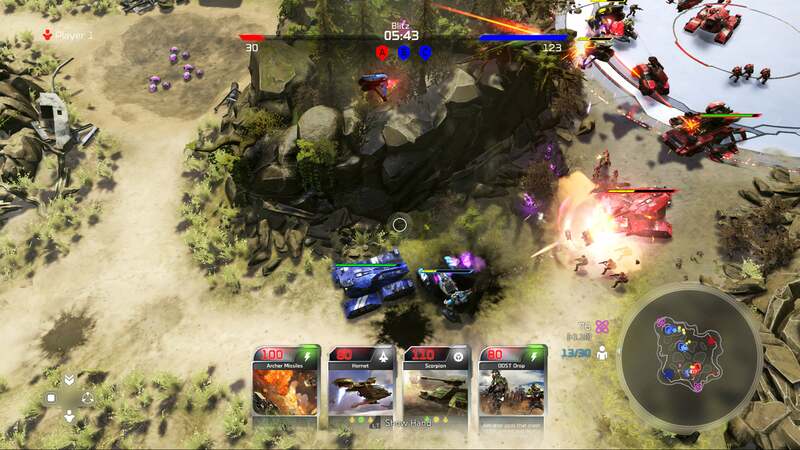 Instead it’s the brand new Blitz mode that hooked me, and has me thinking Halo Wars 2 might be the best non-StarCraft, non-Warcraft chance for an RTS revival. Blitz is basically RTS-lite. “You can see how RTS inspired MOBAs,” said Ayoub. “What you’re going to see with Blitz is how we’re taking inspiration from MOBAs and bringing it back into the RTS.” There’s no base-building, no lengthy setup phase. Instead, each player has a pool of energy with which to summon units. Not just any units, mind. The key to Blitz is a deck-building component. You pick from one of six Commanders, each with unique skills. From there, you’re in control of the makeup of your army—be it dozens of low-cost units/cards you summon en masse to overwhelm your enemy or a few high-powered ones you save up for. Unit cards are then surfaced into your hand four at a time, ready for you to activate. A group of weak infantry might cost you 20 Energy to field, while a Warthog would cost 60 and a MAC Blast (a big laser that fires from space) would cost 100. Energy is harvested by sending units to pick it up from specific points on the map, leading to a balancing act where you have to decide which unit you can spare in the next battle, lest your enemy steal that Energy first. What makes Blitz so fantastic, at least in my opinion, is it cuts right to my favorite part of any RTS match: The part where two big armies meet and trade blows. Warthogs circling, ranks of infantry firing into each other’s lines—its chaos, new units simply dropping right into the fray as players accrue more resources. And that’s just fine with me. I’ve never been great at that stuff anyway. 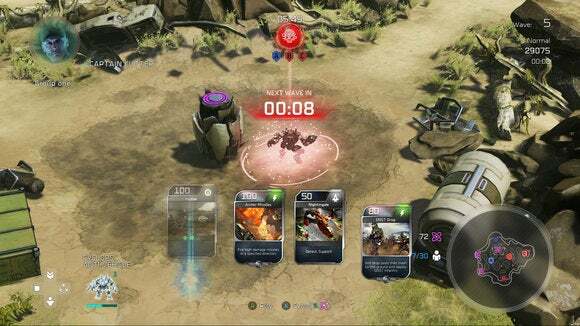 Blitz takes fifteen or twenty minutes per match, is heavy on the fighting, and half of the strategy (deck-building) takes place outside the game. It’s different enough that it’s got me interested. Which is not to say everyone will fall in love with Blitz. I’m not that foolish. Some people love that meta, love the good ol’ fashioned base-building, slow-stabs-at-an-enemy’s-weak-spots RTS multiplayer. 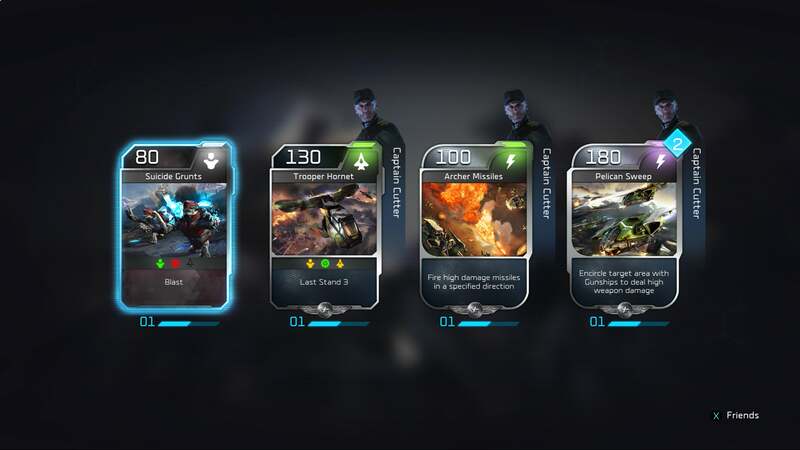 That mode also exists in Halo Wars 2, and maybe it’s good. I don’t know. We’ll have to see when the full game releases in 2017. But I played one round of Blitz and when it was over immediately jumped back in for another, knowing what I could’ve done better, knowing where I’d brought in the wrong troops, knowing this time to hold back some Energy for last-ditch defenses. It’s tight. It’s approachable. It’s quick. To be honest, it’s the sort of mode I would’ve expected Blizzard to make, given Heroes of the Storm, Hearthstone, and Overwatch—all very forgiving, very welcoming games for genre newcomers, but still possessing an underlying depth. Halo Wars 2, or specifically Blitz mode, fits that bill perfectly. We’ll have a more extensive look at both Blitz mode and the rest of Halo Wars 2 when it launches in February of 2017. Maybe don’t write this one off yet though. It’s got some surprises.